Israel Navy ships forced a boat trying to deliver food and medical supplies to Gaza to return to Cyprus early Thursday. Free Gaza group spokeswoman Mary Hughes-Thompson said Israeli naval vessels surrounded the 66-foot (20-meter) Greek-flagged boat off the coast of southern Lebanon and threatened to open fire if it did not turn back. The Israel Defense Forces said navy ships warned the boat to turn back because it was entering a war zone subject to a naval blockade. The ship turned back without incident, the military said. Hughes-Thompson said the boat, carrying five tons of supplies and 21 passengers, including three surgeons, was expected to arrive at Larnaca port in Cyprus by Thursday evening. since Israel launched its assault on the Palestinian territory late last month in response to rocket fire on Israel. threatened to open fire on the Greek-flagged boat Spirit of Humanity, which was carrying the activists. “They told us that it was forbidden to go to our destination. We replied that we were carrying humanitarian supplies and continued on our course,” Pisias told Greece’s private Antenna television. In a statement, Free Gaza said the incident occurred in international waters and described the incident as shocking. “At roughly 1:00 A.M. GMT, in international waters 100 miles off the coast of Gaza, at least five Israeli gunboats surrounded the Spirit of Humanity and began recklessly cutting in front of the slow-moving civilian craft,” the statement said. In Athens, the Greek Foreign Ministry said it had sent a strong protest to the Israeli Foreign Ministry that emphasized and asked for the Israeli authorities to pay particular attention to the protection of the lives and security of those on board the boat. It said protests had also been sent the previous day to the Israeli foreign and defense ministries. Israel does not own International Waters. Seems again they are a bit out of touch with reality. They behaved more like Pirates would. Just a few Excerpts to ponder. The piracy part is rather interesting as well. Law on the High Seas section Pirates?????? Like much of the world, we have spent the last week watching in shock and disgust as Israel continues its assault on the Gaza Strip. With the body count rising and a new tragedy in full bloom, we feel that it is important to speak out as Jewish youth in Canada and to denounce what Israel is doing in our name. 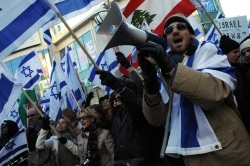 The Jewish diaspora is diverse and divided on its positions on the state of Israel’s policies. At this juncture in history, as Israel has committed its worst massacre in Gaza since it began its illegal occupation in 1967, we feel that it is crucial that Jews speak out and denounce Israel’s actions that amount to no more than war crimes committed by an apartheid state. As Jewish youth, we are diverse, but we are unified in our solidarity with our Palestinian brothers and sisters in Gaza. Some of us are students. We are outraged by the bombing of the Islamic University in Gaza city, as well as other civilian infrastructure such as hospitals and mosques. Some of us are Arab-Jews and people of colour. We stand against Israel’s racism, which has been enshrined in Israeli law, and privileges its Jewish citizens over its non-Jewish ones. This apartheid state views Palestinians as an expendable people, no more than collateral damage. Some of us are queer. We reject Israel’s branding of itself as the only safe place for queer people in the Middle-East while it targets gay and lesbian Palestinians and renders life unsafe for millions of others. Some of us are Israelis living in Canada. We are calling for a solidarity that stretches beyond borders and nationalities. Israel’s violent actions will only serve to further isolate the state and its citizens from the rest of the world. By calling itself a Jewish state and committing war crimes in the name of Jews everywhere, Israel makes the world even less safe for Jews, leading to an increase in animus towards Jewish people around the world. Even though there have been approximately 100 Palestinian deaths for every Israeli killed by rocket fire, we recognize that Israeli Apartheid also leads to Israeli casualties. The blame for these deaths lies with Israel – if there were no occupation and no apartheid policies, there would be no rocket fire. If Israel, the world’s fourth largest military power, is concerned about its citizens, it would abandon its apartheid policies and seek out justice for the Palestinian people. 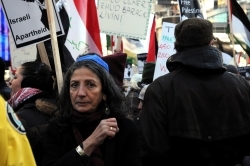 In 2005, Palestinian civil society put out a clear call for international support through a non-violent campaign of Boycott, Divestment, and Sanctions (BDS) similar to that carried out against the apartheid regime of South Africa. Now, with the people of Gaza being crushed by Israeli bombs, manufactured in the USA and launched with Canada’s blessing, it is more important than ever for Jewish communities throughout the world to take up this BDS campaign in order to end Israel’s apartheid system, which makes life unsafe for millions of Jews and Palestinians alike. Ours is a generation that is committed to ending Middle-East violence by opposing all forms of discrimination, calling for a just peace within the entire region, and condemning Zionism to the dustbin of history. To sign on to this letter, send an email to antizionistjews@gmail.com with your name and city. There is much “wisdom” in the words these children are saying. Many adults could learn from these children. Seems the children are well informed and are not blind to the actual realities of what has been happening. Through the eyes of a “Child” will we see the “Light”.